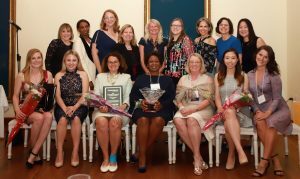 Congratulations to all of our 2018 Annual Award Winners who received their awards at our fantastic Gala dinner on June 13th at the Rosewater in Toronto. President’s Award Winner – Arleen Huggins, Partner, Koskie Minsky LLP. General Counsel Chapter Award Winner – Judy Naiberg, VP, Legal & Business Affairs, Sony Music Entertainment Canada Inc. The Torkin Manes LLP/WLAO Trailblazer Award was awarded to Sarah Firestone from the University of Toronto School of Law, accepted by her parents at the dinner.